Kate Gavino is a writer and illustrator living in Brooklyn. Over the last few years, she has attended hundreds of readings around New York City in venues ranging from factories to cemeteries, chronicling each one on her Tumblr. In 2018, she was named one of Brooklyn Magazine's "30 Under 30." Her graphic novel, Sanpaku, is forthcoming from Boom! Studios. Featured in O, The Oprah Magazine's "Gratitude Meter" as one of "5 things we can't stop smiling about this month!" "This book of illustrated quotes from authors will inspire you." "A witty love letter to the literary world." "Kate’s drawings of authors at readings in New York are tremendous, but the quotes from each that she chooses to accompany her skilled art make this book a true treasure." "You have a favorite writer, and he or she is likely immortalized in Gavino’s distinctive marker next to a brilliant soundbite...We’re so lucky to have [Kate] silently sketching, chronicling among the seats—she always seems to catch the most poignant moments that sometimes pass by the rest of us." "Books of inspirational quotations appear to be a growing trend, especially for gift-giving…My favorite so far is the charming Last Night's Reading, by Kate Gavino." "Part of the appeal of literary readings is the chance to see in person the writers behind the books—to see how they carry themselves, to listen to them speak, and to witness their offhand moments of humor or insight. Illustrator Kate Gavino captures these moments in her new illustrated book." "As inspirational as it is beautiful." "Funny, deep, insightful and maybe even life-changing illustrations." 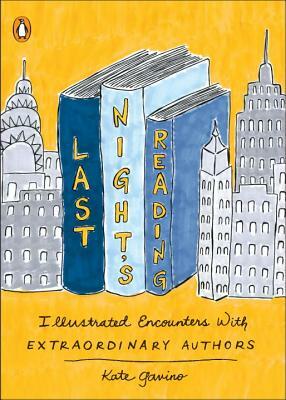 "[Last Night's Reading] gives you a glimpse of the ingenious minds of contemporary authors...in a joyous manner through Kate’s colorful drawings." "Definitely a book that you'll want to add to your library or gift to your favorite book lover. You won't regret it!" "Everything about this book, from the drawings to the hand-lettered quotes, is absolutely charming."